I must admit, I’m not a morning person, let alone an early morning one. If I don’t have a particularly appealing reason for getting up earlier than necessary, I really won’t. So don’t ask me to go for a jog, it’s just too hard for me. What I can do though, with little to no effort, is to wake up and perform a gentle yoga sequence. It may take you a few days to get into the routine, but you’ll immediately notice the benefits, and how different you’ll feel on the days when you skip the practice. Tried and tested! So, according to my personal experience, and by listening to what students say, here are the top 5 benefits you’ll experience as you start practicing morning yoga. Remember: it doesn't have to be super early, it just depends on what time your day normally starts! You can start your awakening process by clearing your mind through a short meditation. You’ll be ready to concentrate on a couple of simple one-leg balances (e.g. standing tall hugging one knee up to your chest, or a standard Tree pose), and you’ll be forced to keep your focus. This will forcedly wake you up, and your brain will be more ready than ever to focus on your next tasks for the day. Moving your body involves, by default, cell movement, and therefore cells' oxygenation. When your cells refresh the oxygen that runs through and between them, your whole body reinvigorates too. It’s a simple process, and scientifically proved. Some people buy a bouncer and just jump for 30-60 seconds every morning. Some others may not have enough space in their homes and prefer a gentle series of Sun Salutations for their morning yoga practice. It must be called "Sun Salutation" for a reason, right?! Bringing your head, arms and legs where they don’t normally spend the rest of the day is a super energetic routine to kick start your day. You’ll immediately feel fresher, lighter and definitely more awake! With more oxygenated cells and a clearer focus on the day ahead, you will automatically feel more relaxed: you won’t be worried about that big meeting with the boss, and you’ll know exactly what you have to do to conclude another successful day. This is because your stress levels will be lower, and you’ll be able to face your day with a more positive approach. 4. You Can Eat More! Foodies like me will particularly appreciate this one: we all know that exercising can contribute to weight loss. Spending 20-30 minutes every morning between Downward Dogs, Planks and Warrior IIs will boost your metabolism, improve your digestion, and those extra calories will be gone before you know it. So yes, you can afford a little dessert every now and then without feeling guilty! As usual, be mindful and don’t exaggerate. It’s your body: treat it well as it deserves! Not only you can enjoy a few extra calories, but your body will start changing shape (for the better): your arms will be more defined, your back will get stronger, and your legs will look even longer in those skinny jeans. I don’t promise dropping four sizes within a month, but give yourself a chance and you (and the people around you) will start noticing the positive changes. Alternatively, below you can find a simple routine that you can practice daily as you wake up. 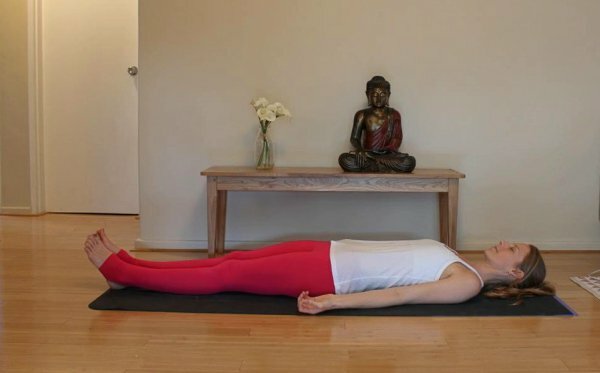 Start lying down on your mat facing up, in supine, relaxed pose. Press the knees into your chest, drop them to the right, look over your left shoulder as you open the arms in a T shape, and feel the stretch in your spine. After 5 breaths, switch sides. Practice 3 slow Sun Salutations (Surya Namaskar A in Sanskrit). What about you? What would get you out of bed earlier than usual? What changes have you noticed if you’ve been a morning yogi for a while? Share your experience with the community in the comments below!